KCNF files Supreme Court amicus brief supporting WPEA claims for EEO retaliation | Kalijarvi, Chuzi, Newman & Fitch, P.C. On September 6, 2016, the Ninth Circuit U.S. Court of Appeals affirmed the dismissal of Leslie Kerr’s whistleblower retaliation claim against the Department of the Interior. The court held that federal employees who comply with the administrative exhaustion requirements governing EEO claims in mixed cases, cannot include in their subsequent district court suits claims alleging reprisal arising under the Whistleblower Protection Enhancement Act (WPEA). The court recognized that its holding is in conflict with Wells v. Shalala, 228 F.3d 1137 (10th Cir. 2000), setting up a circuit split that only the Supreme Court can resolve. Indeed, Leslie Kerr has petitioned the Supreme Court to grant review of the Ninth Circuit’s decision. The Government Accountability Project and Felecia Redding filed an amicus brief in support of Ms. Kerr’s petition. KCNF, which represents Ms. Redding, drafted the brief for her and GAP. 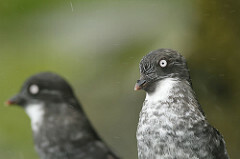 Leslie Kerr worked for the Fish and Wildlife Service (FWS or the Agency) as director of the Kodiak National Wildlife Refuge (the photo shows protected auklets). In the early 2000’s, Kerr raised concerns about alcohol abuse by other employees at the Refuge. In 2005, her supervisor asked her, “This is going to sound sexist as hell, but couldn’t you learn to be more feminine?” The supervisor gave Kerr a low performance rating, and Kerr complained. The supervisor transferred her, and she refused the transfer. The agency fired her for refusing the transfer, and she filed an EEO complaint alleging that the transfer and removal were discriminatory. Although it was not a basis of her EEO complaint, Kerr believed that her disclosures about alcohol abuse were also a factor in the decision to fire her. The Agency’s Office of Civil Rights rejected Kerr’s complaint, and she filed suit in the U.S. District Court in Alaska. That court dismissed her WPEA claims and tried her EEO claims to a jury. The jury found in favor of the Agency, and Kerr appealed the dismissal of her WPEA claims. The Ninth Circuit’s decision affirming the dismissal is now pending before the Supreme Court. On behalf of the GAP and Ms. Redding, we argued to the Supreme Court that the “mixed case” statute, 5 U.S.C. § 7702(f), permits federal employees to file a lawsuit raising both discrimination and civil service claims after exhausting through only one agency process. However, the decision below flies in the face of these statutory provisions and requires victims of retaliation to exhaust at least two administrative procedures to give the district court jurisdiction of all their claims. As the Supreme Court has recognized, the public’s interest in protecting from reprisals employees who file complaints allowed by statute is so strong that the Supreme Court has imputed such protection into laws that have no words creating it. See, Jackson v. Birmingham Board of Education, 544 U.S. 167 (2005) (Title IX); CBOCS West, Inc. v. Humphries, 553 U.S. 442, 128 S. Ct. 1951 (2008) (42 U.S.C. § 1981); Gomez-Perez v. Potter, 553 U.S. 474 (2008) (ADEA). The Ninth Circuit erred when it held that § 7702(a)(2) does not authorize Kerr to bring her Whistleblower Protection Act (WPA) claim directly from the EEO office to district court. The requirement that an employee exhaust mixed-case EEO retaliation claims through the Office of Special Counsel (OSC) and MSPB is particularly ironic because OSC’s own policy states that it “will normally avoid” investigating such claims because employees can raise them separately in the agency EEO process. See 5 C.F.R. § 1810.1. Also, the MSPB has been less than consistent about applying the WPEA to protect EEO concerns. Other circuit courts that have addressed this issue have concluded that district courts possess juris-diction to decide non-discrimination claims in mixed cases when agencies fail to meet the time limits in § 7702(e)(1)(B). Employees may bring “mixed cases” to district court, even if the original administrative EEO complaint did not expressly articulate the legal theory underlying the “mixed case.” Generally, there is no requirement that a complaint set out the legal theory that permits relief for the facts alleged. The decision in Kerr runs counter to the administrative economy of the mixed case statute, which allows whistleblowers to preserve all of their claims by using just one of the available agency proceedings. It also runs counter to the remedial purpose of the 2012 WPEA, which explicitly extends protection both to “any disclosure” of violations of law and federal employees’ participation in official proceedings. Finally, it places federal employees in the dilemma of having to waive all of their civil service remedies (including their WPA remedies), just to bring their retaliation claim to district court. The Amicus Brief urges the Supreme Court to grant Kerr’s petition and reverse the decision of the Ninth Circuit. Richard Renner authored the amicus brief discussed in this blog. Update: On March 20, 2017, the Supreme Court denied Ms. Kerr’s petition for certiorari.